It’s been three years since Squidoo ran aground and our lenses were transferred to HubPages. While I don’t miss the frequent rearranging of deck chairs that SquidHQ required of lensmasters in its last two years, I do miss the revenue and freedom to publish curated lists. My annual earnings on HubPages have been less than what my typical monthly earnings were on Squidoo, even in its final months. This is mainly because my hubs don’t get anywhere near the amount of traffic they did as lenses and HubPages tightly limits the number of Amazon and other affiliate links. To make matters worse, you never know when editing a hub will cause that hub to become unfeatured (meaning it won’t be crawled by search engines or featured on other hubs). That’s because editing a hub sends it through the arbitrary quality assurance process where it may get dinged because of a new interpretation of what makes a quality hub, even if it’s been featured for over three years with no issues. This can effectively discourage authors from maintaining their hubs by fixing broken links, adding content, etc…the opposite of what HP staff should want. So I’m finally doing what a lot of other former lensmasters had been recommending, moving some of my content to my own sites. Not all, only those pages which don’t fit HubPages’ rules, particularly on number of Amazon links, or content that can justify and support being on its own site. Particularly content that I want freedom to format and update how I want without wondering if an edit will cause it to lose featured status. My first launch of redeployed lenses is the Lost Books List featuring much of the content from my lenses on the TV show Lost. Being a book list, the pages had more shopping links than HP permits and had been unfeatured for a while. I’m a fan of the show that enjoyed watching for new books and researching them for the list so I wanted this to have a new home. Many of my other hubs will remain on HP. The hubs that are on HP’s niche sites generally do a little better than those on the main site. I may even add new ones there since HP is still a platform to publish stand alone articles on a topic and I tend to get writing ideas on a variety of subjects. I’m moving another group of lenses/hubs to a new site of my own that I expect to announce soon. And I have a few ideas for other moves. Unfortunately, several of my hubs will be left to rot in unfeatured or unpublished status. They don’t fit HP’s model and aren’t worth the effort of moving to a stand alone single topic site. Each month I’ll feature a lens that I discovered while exploring Squidoo. Most people want a job. Getting a job requires doing well in the interview. To land a programming or software engineering job, you better be prepared for that interview. Interviews for programming jobs focus on your understanding of languages, concepts and how to use them effectively. You’ll also be expected to talk about how you solved technical problems in prior projects. 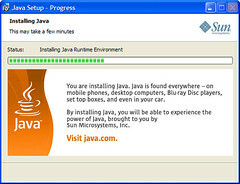 To help you get ready, there’s the Java interview preparation guide by TheLastResort. The guide provides background info on Java, employment trends, sample interview questions, tips and recommended books. The book lists are comprehensive, covering Java and software design concepts that are applicable to most languages. Each recommended book has a detailed description of why it’s recommended and for what purpose. If this is your first programming interview, the list of example questions will open your eyes to the level of technical questions you can expect. I’ve been on both sides of the table in programming job interviews during my career and like this list. While the guide focuses on preparing someone new to Java for an interview, there’s good info for long time programmers as well. The best way to be prepared for any type of interview is to do. Work on your skills every day. Image Credit: hillary h used under Creative Commons. Sometimes you have content for a lens that’s best presented in a table. But Squidoo doesn’t allow HTML <table> tags in any modules. Fortunately, there’s the SquidUtils Table Generator developed by lensmaster thefluffanutta to help you build custom tables for your lenses. Press a button and the tool shows you a preview of the table with your data and gives you the code to copy. The preview makes it easy and quick to experiment with different options. When you’re happy with how the table looks, copy the code and paste into a text module on your lens. Now that your data is in a proper table, you can publish as is or customize the formatting even more if you want. A few ways you can do this are to bold or italicize text, add hyperlinks and adjust the cell widths. 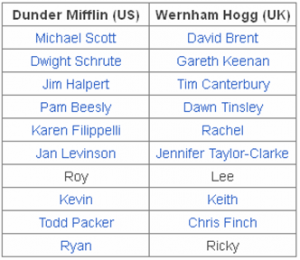 On my Office TV Show lens, there’s a two column table that matches characters from the UK version of the show with their counterparts on the US version. The table generator settings for this were Border: Boxes; Border Color: black; Shading: None; Alignment: Center. After copying the generated code into a text module, I modified it by bolding the header row text to help that stand out. Then I added hyperlinks for most of the character names. 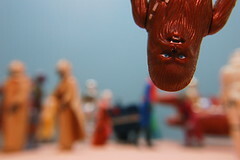 The links help readers find more info about each character and potentially increase clickouts. My Fantasy Football Addiction Test has a table to tell readers what their score means. The generator settings for this were Border: Header; Border Color: blue; Shading: None; Alignment: Left. I customized this table by bolding the text in the header row and all of the scores in the first column. Since the text in the left column is shorter than what’s in the right column, I adjusted the width settings of each cell (width:140px and width:440px, respectively). This balances the table and allows enough room for the longer text in the right hand column. 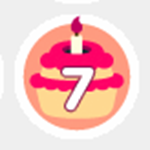 Today is my 7th Squidiversary on Squidoo! Here’s a shot of my new 7 year trophy. It looks suspiciously like the 6 year trophy. Maybe HQ figures that any lensmaster this old is color blind by now. Two new lenses launched in celebration of this milestone. The first is Gifts for LOST Fans. Yes, the tide of interest in the TV show LOST went out a long time ago. This had been on my lens idea list since before the show ended. It was now or never time to build and I wanted it to complement my books seen on LOST lens. The second new lens shot from idea to creation in a few days. It’s for people looking to buy gun window decals and stickers. I see lots of bumper stickers on my daily commute and the gun themed ones are usually funny. C-3PO, Darth Vader, Luke Skywalker, Bossk, AT-AT Driver, Chewbacca…those are a few of the Star Wars action figures I had growing up. That was a long time ago and they’ve all since gone to the great toy box in the sky. But if I ever want to replace them, there’s a lens to help me determine a fair price for each. The Vintage Star Wars Action Figure Price Guide by lensmaster Grumpy-Fett (great nic) covers current prices for all of the original Star Wars figures from the first 3 Star Wars movies. It’s a must read for new and experienced collectors of these toys. Don’t take my word for it, scroll down to the lens’ guestbook. Most of the comments are from non-lensmasters. That means real web surfers (the visitors who matter most) find it useful and worth their time. Establish credibility. Grumpy-Fett details their experience as a Star Wars fan, vintage collector, collectible toys merchant and sarcastic galactic bounty hunter. They also explain how these prices are researched and how the guide is intended to be used. Be a total nerd about your topic. You’re not going to build and maintain a lens like this unless you love your topic and know it well. That shines through in Grumpy-Fett’s writing. Keep it current. Compiling and publishing all of this info doesn’t help readers if it goes stagnant. The lensmaster updates pricing info, answers questions in the guestbook and updates the title with the latest revision date. Even if you’re not into Star Wars toys, Grumpy-Fett’s advice on price versus value and how to use price guides is applicable to any collectibles market. It’s well worth a read. Image credit: JD Hancock, used under Creative Commons. Do you love eating at Five Guys? I do. And now there’s a lens where fellow fans can vote for their favorite things about Five Guys. You’ll find a description and poll for each thing that makes Five Guys deliciously unique. There are also mouth watering photos to get your belly growling. This lens took months to build. Partly because the Flickr fiasco hit soon after I started, but mostly because when I started working on it, I’d get a sudden craving for a bacon cheeseburger and order of fries. There are many good lenses on Squidoo. When reading them, I look for the unique and good elements of the lens. Yet I’m often tempted to think about what I might do differently if it was my lens. Not with this month’s catch. 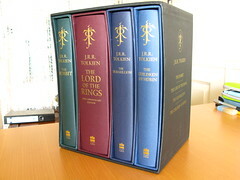 My Favorite Quotes by JRR Tolkien is the best lens I’ve discovered on Squidoo in many moons. Lensmaster Greekgeek has crafted a personal tribute to one of her favorite authors, JRR Tolkien, focusing on Tolkien’s quotes. She explores the meaning behind each quote and how it relates to her (I loved the English teacher story). The lens seems so simple but is very powerful. Greekgeek’s elegant use of language in her descriptions and the way she weaves a consistent flow through the intro, module titles, sub-titles and body are a lesson in good writing and lens crafting. She keeps everything focused. There’s nothing to distract the reader from the purpose of the lens. Best of all, the content is interesting. I found this gem while reading Greekgeek’s blog post on using CSS with Squidoo’s new responsive design. She used it as an example of using CSS smartly to serve a functional purpose. In this case, for highlighting Tolkien’s quotes. Enjoy, learn and have a Happy New Year! Image credit: Jemimus, used under Creative Commons. It was another interesting year for Squidoo lensmasters. The year’s events included the Flickr module fiasco; the front doors (SquidLit, etc) were retired; Kimberly left; Megan left; new magazines started (I cancelled my subscriptions to all magazines); the SquidU forum closed; a new official forum opened; the release of Squidoo Postcards (still don’t get the purpose of them); the ill timed and poorly communicated (but good for the long term) responsive redesign; and tier payments continued to grow (the tier 1 payout for December 2012 was nearly 50% higher than December 2011’s payout!). How did I do on Squidoo this year? I missed every one of my goals for 2012. New Lenses – Only 4 new lenses launched this year, including my 100th published lens. I used most of my Squidoo time for maintaining existing lenses, stats analysis, reading forum posts, a few blog posts and repairing lenses after the Flickr fiasco (still plenty of work to do there). Revenue – My Squidoo payouts grew 18% over last year thanks to a mix of higher tier payouts and increased sales. Revenue growth was trending higher, but several lenses that normally get to tier 1 or 2 had weak lensranks in the last half of the year. In the last two months of 2012, only one of my lenses made tier 1. Other affiliate income from my lenses grew 4.5%. Blog Activity – Only 9 (including this one) posts made this year. So my goals for 2013 will be a repeat of 2012’s…but with a strategy for better execution. 1. Have at least 120 published lenses by end of the year. Four new lenses in one year was inexcusable. New lenses will be a higher priority for my limited Squidoo time in 2013. 2. Grow Squidoo revenue by at least 50 percent over last year. Relying on old lenses to repeat past lensrank and tier earnings performance isn’t a viable long term strategy. 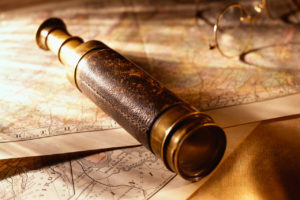 New lenses and sales performance are the key focus areas. I also want to increase other affiliate income by 50% but 25% may be more realistic. 3. Maintain a consistent posting schedule on Lens Harbor. Two posts a month minimum, not counting lens launches. I’ve done this the last two months and need to continue. My challenge across these goals will be focusing on a specific task each time I sit down at the computer. I tried that when working on my last lens with good results, now I have to make it a habit. Have a fun and prosperous 2013! One hundred lenses. Finally. It took a long time to reach this milestone, nearly seven years. Although it’s a symbolic one, I wanted to mark it with a lens that meant something. Both my grandmothers died as a result of stroke. Both my grandmothers-in-law have suffered a stroke and are dealing with its debilitating effects on them. The damage caused by a stroke can be reduced if it’s caught early. Everyone should learn how to recognize a stroke. That’s why my 100th lens is on the warning signs of a stroke. Yes, there are already lots of websites and publications with this information. No, it won’t rake in big earnings (its proceeds will all go to charity anyway). That’s not its purpose. Hopefully, someone somewhere will read it and be prepared to recognize when someone near them is suffering a stroke and get them the care they need in time to make a difference. This is the most personal lens I’ve written. It’s dedicated to my wonderful grandmothers and grandmothers-in-law. This month’s catch highlights the value of personal recommendations in a lens. In My New Jersey Wine Quest, lensmaster Sockii shares her quest to visit every winery in the Garden State. I’m originally from NJ and enjoy wine, so this lens got my interest when I found it. The lens includes a listing of all the wineries in the Garden State Wine Growers’ Association and Sockii’s detailed review of each winery she’s visited including pictures she took there. She also explains the motivation behind her quest. Her reviews of the wineries are honest and personal. They include her impression of the winery and each wine she tasted. I like that she shared her wine preferences (dry vs. sweet, oaked vs. unoaked chardonnay, etc) which helps the reader relate each review to their own wine tastes. She was right. When my wife and I were in NJ this month, we visited Auburn Road and really liked it. Definitely the best NJ wines we’ve tried so far. It’s also a cool place to hang out and enjoy the wine. We bought several bottles. 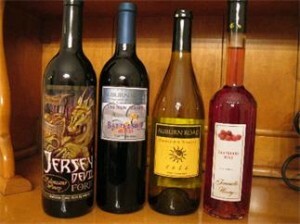 Two of them (we’ve already given the rest as gifts) are in the image above with the other NJ wines in our wine rack. Thanks to Sockii for the reviews, spreading the word of NJ’s growing wine industry and the tip about Auburn Road. Without her lens I might not have discovered this outstanding winery. Header Image: Old Town Harbour at Night by hozinja, used under Creative Commons.